About the banner: The photo shows the south end of Lake George just off Fort William Henry. The historical marker notes the many vessels sunk in the lake by the British in 1758. 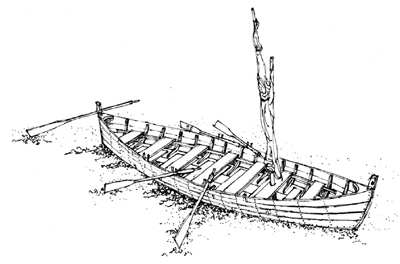 Drawing of a colonial bateau (Image by Mark Peckham; courtesy of Bateaux Below, Inc.). 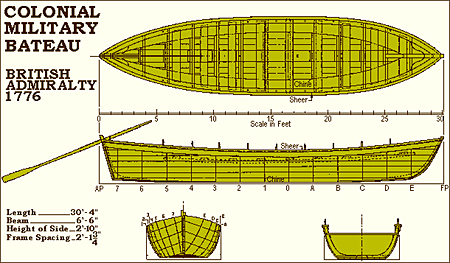 The bateau was the most common inland waterways vessel of 18th century North America. "Bateau" is French for "boat," but it was also the name for a flat bottomed watercraft, 25 to 40 feet long, that was used on Lake George. The vessel was made of pine planks with oak frames, stem, and sternpost. The boats may have been Dutch in origin. Bateaux were also used by the French, British, and later, by Americans. The bateau was pointed at bow and stern and had an oar tied at the stern for steerage. A bateau could be rowed, poled in shallow water, and sometimes a crude mast and sail were used. During the French and Indian War, bateaux were built in Schenectady and Albany boatyards and then transported over water and land to Lake George. Drawing of a typical 1776 British military bateau that would have been similar to those used on the lake in the French and Indian War from 1754-1763 (Image courtesy of New York State Military Museum and Veterans Research Center).